A must-visit if you're in Montpelier, from the fantastic selection of local beers to the delicious food. Their burgers are top-notch and I highly recommend getting the TPT Fries (fries with house sauce and carmelized onions), which are absolutely delicious. The taplist is phenomenal: expect to see plenty of Lawson's and Hill Farmstead. Don't be afraid to ask if they have any Heady or Focal available as well. When I miss out on Lawson's bottle releases, I can almost always catch it on draft here. Cool atmosphere (especially during big soccer games) and just an overall cool place. Living closer to Burlington, whenever I find myself in Montpelier - sometimes I check TPT out as I don't mind personally the "older pub-like" mentality of this place. However, compared beer bars in Waterbury and Burlington, this place is over rated. Food is good at best. Service is good. It's loud and not a place to take young children. More stuff popping up in Barre and Burlington, save your money for those places. The beer selection and quality are great, one of the best tap lists around. I was a little surprised at the small size of the pours. An 8 oz pour of a HF DIPA was $7 - delicious but costly. The service was prompt and friendly. The food we ordered was good but quite expensive. It's a nice pub with great beer, good service and decent food, but all at fairly high prices. 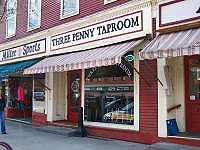 Three Penny is always my first stop in Vermont, on the way to Waterbury. For me, it' the gateway to the Northern Kingdom. Friendly & welcoming atmosphere, with great comfort food, and one of the best taplists in all of Vermont. Always 4-5 HF brews on tap, plus regulars like Lawson's SOS & Super Session, as well as various other locals. A must stop. Great place with an awesome selection of VT brews and selected high quality American and import choices. They usually have Heady and Focal Banger in cans and always have some options from Hill Farmstead and Lawson's on tap. The vibe is comfortable. Nice bar and separate dining room. Big window views of the main street. The food and beer is very high quality and they make sure to provide local and well made menu items. Menu is not huge, but has a pretty good variety. Burgers are great. Fries are great. Service at the bar is always great. Knowledgeable staff, very friendly, no hipster vibe at all. They are helpful with decisions for food/beer and are quick to offer a taste from the taps to help with your decision.